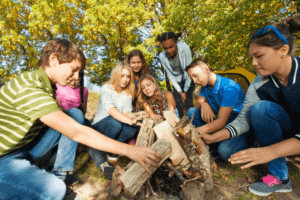 Zipline Adventure – Trail Blazer Survival School, Inc. This is adventure at its best! Begin your 5.5-hour adventure by leaving your car behind and ride with us from Simpsonville/Greenville SC to a perch on a rim, not far away in North Carolina. 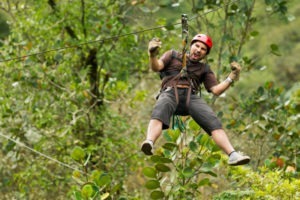 Then plunge into the wilderness on 11 ziplines, a sky-bridge, and more. You will enjoy unique perspectives from tree-based platforms. Your zip runs will range from 200 to 1200 feet each in length. Experience breathtaking views of the surrounding mountains. GET READY FOR THE ADVENTURE OF YOUR LIFE! Our adventures leave promptly at the scheduled time. Therefore, we recommend that guests arrive at least 15 minutes prior to tour time in order to allow for parking, checking in, etc. No refunds will be issued too late arrivals – if you fail to show up for the adventure on time, we still incur the same costs and may have turned other potential guests away. Our adventures operate rain or shine and regardless of temperature. Check the local Greenville SC and Western NC mountain weather before you arrive. Wear appropriate clothing for the expected conditions (layers recommended). Close-toed footwear that is suitable for hiking on variable terrain is required. Avoid wearing loose clothing such as ponchos, scarves, and excessively baggy clothing. Short shorts are not recommended. Due to the nature of ziplining, we recommend that guests leave valuables such as jewelry at home and cell phones in the bus during our adventures. Cameras/phones are not permitted during ziplining due to the likelihood that they will be dropped and/or broken. Our zipline adventures run rain or shine, in all weather conditions, unless extreme winds or lightning interfere with operational safety. The Zipline Course Manager on duty will determine zipline cancellations, and guests may be notified at any time regarding these cancellations. In the event that your adventure is canceled, you will receive a full refund or rain check voucher depending on the circumstances. We reserve the right to postpone (or pause) an adventure to wait out inclement weather and then resume normal operations. Participants should be comfortable without access to restroom facilities for over 2 hours at a time. Restrooms are available at our facility before leaving on your adventure, and at the zipline location before and after the end of your zipline adventure. All participating guests must weigh between 70 and 250 lbs, and we discretely verify weight at check in. All guests must be in reasonably good physical condition, with the ability to pull yourself hand over hand along a cable (your weight is supported by a harness). There may be short hikes on well-maintained trails, but guests should be comfortable walking on uneven terrain. Also remember that our adventure can last 5 to 8.5 hours. Congrats! But we don't want to put you or your baby at risk, so we don't allow pregnant people to zipline. We look forward to seeing you in 9 months! Guests with conditions that require fast acting medication, like asthma or anaphylactic allergies, should bring their medication with them and make their guides aware of their condition prior to the start of the trip.